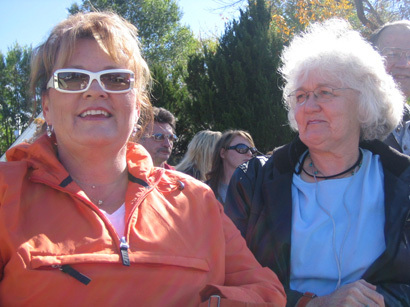 October 23, 2006 | Diane Wright sold her Brooks & Dunn tickets to drive 312 miles just to see the Extreme Makeover: Home Edition. "My husband asked me why I wanted to come because all I do when I watch the show is cry," she said. She left her home in Nampa, Idaho, at 9 a.m. Friday and arrived in Logan around 2 p.m. Last week, she started to receive emails from her mother-in-law with all these construction crews and an old home. She didn't get it. But when she saw some famous faces in the shots, she recognized right away as her favorite show that she's watched every week since it aired, and she knew she had to come and see it in person. One hundred dollars later, sales from her concert tickets, Wright enjoyed every minute of the construction. Wright planned to be at the site by 8 a.m. Sunday. With no tears Saturday, Wright expected to cry Sunday after hearing those famous heart-wrenching words, "Move that bus!" Wright wasn't alone Saturday. As the sun reflected off their white and orange helmets, the construction crew worked on finishing touches on the exterior of a huge new home; painting the garage door a dark brown, and metal roofing over it; setting up flower pots and the backyard. People from around the area came to check out the home, which was revealed Sunday in the early afternoon after the Paunis returned from the Virgin Islands. Saturday's work was filled with lots of volunteers, from Utah State University students to Logan Cub Scout troop 227, members of which were filmed by ABC's crew as they set in place several plant and flower displays by the new front door. Thanks to an anonymous donation, even a well-known local celebrity visited the site. 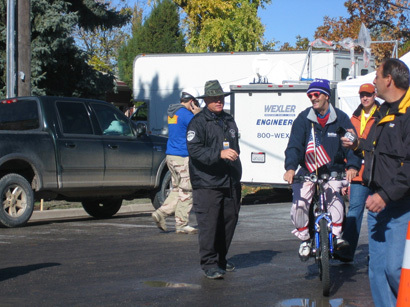 Brent Carpenter, best known for his energetic bike horn and smiling wave, was part of the first group of those not associated with the construction team to tour the interior of the home. With few words but lots of smiles and giggles, Carpenter rode onto the site, quickly put on his Home Makeover T-shirt and in his words, "cold" blue helmet. The $2,000 donor asked that from that gift four people from the community receive a tour.